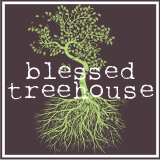 Blessed Treehouse: Surviving the minivan. We did it. We bought a minivan. But don't freak, yo. We DID NOT adorn it with stick people figurine stickers and fake baseball window shattered decals. It's silver. It's crisp. It rocks. And here's how I roll. I slide in, crank up 107.5, and turn on my imagination. Chrysler who? I'm cruising down the 270 in a slick black Range Rover, tinted windows, spinners, and . . . and those kids in the back? They my posse. In all seriousness, I had to laugh when we bought it because I was often asked by my peers, "How are you feeling now that you drive a minivan? Are you okay?" You would have thought I received a fatal diagnosis. But the diagnosis is perfect. With this new set of wheels I foresee hours of reaching back and tickling tiny toes, years of carpooling to baseball games, and miles of roadtrippin' with the fam. I couldn't ask for a more beautiful future, and believe it or not, I'm thrilled to create memories in what this generation of parents is affectionately naming the swagger wagon. How about you? Do you fear the minivan or have you embraced it and all its sliding door glory? I'm a soccer mom, and I own it. I have to admit that I still cringe when I walk out to the parking lot and realize that when I hit the unlock button it is my MiniVan that chirps back at me. Oh girl, I embraced it years ago! I had to to be able to have a passenger. But my mom never has. She still drives a Buick. p.s. I told my Sunday School class the other day that my dream car is a 2011 Honda Odyssey and I was completely serious! No shame! I'm buying you stick figure decals for Christmas. We took the plunge about 6 weeks ago and as nice as it is, it is still an adjustment. I have to agree with one of my co-workers who told me, "When I'm in my van, I love it. When I'm standing outside looking at it, I hate myself." Do have to say that, with two kids, it is much easier than the '02 Nissan Sentra I was rocking since college.